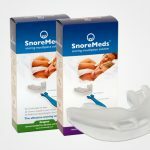 The Good Morning Snore Solution –also referred to as GMSS– is an anti-snoring mouthpiece which is clinically proven to treat people who suffer from heavy snoring and sleep disorders such as sleep apnea. 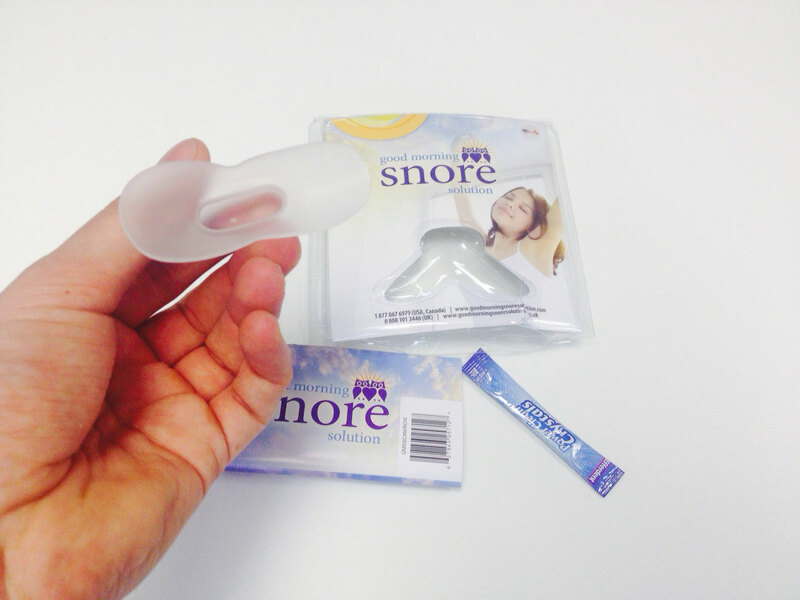 In contrast to other snore solutions, the GMMS is proven to be effective. For so many years, snoring has been a problem that disrupts sleep of others in your household (including your bed partner). While there are several options that promise to deliver the best results, they are not able to address the exact problem. 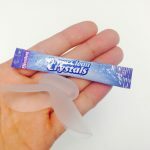 Unlike many anti-snoring oral devices which make use of mandibular advancement techniques that moves your jaw forward to open the blocked airway, this one-size-fits-all mouthpiece comes with a sucking mechanism that holds your tongue forward and steady in the mouth, in order to avoid it from falling back into the throat while sleeping which triggers snoring. For this reason, the Good Morning Snore Solution is much more effective than MAD devices. 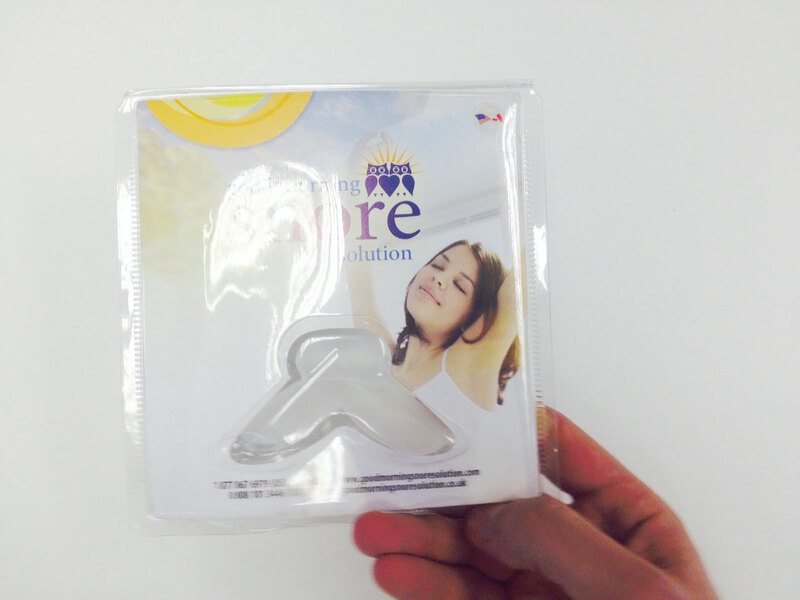 It is a powerful, highly effective, comfortable, one-size-fits-all solution for snoring—my #1 rated mouthpiece. 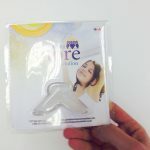 In order to have a better understanding of why this anti-snoring device is so effective, it is important that you first understand why it is that people snore. The reason is quite simple-when the air passage is blocked, both in the nose and mouth, it brings about snoring. When a person that breathes starts to snore, the upper walls of the throat react to the blockage by vibrating, which results in the distinct sound of the individual. 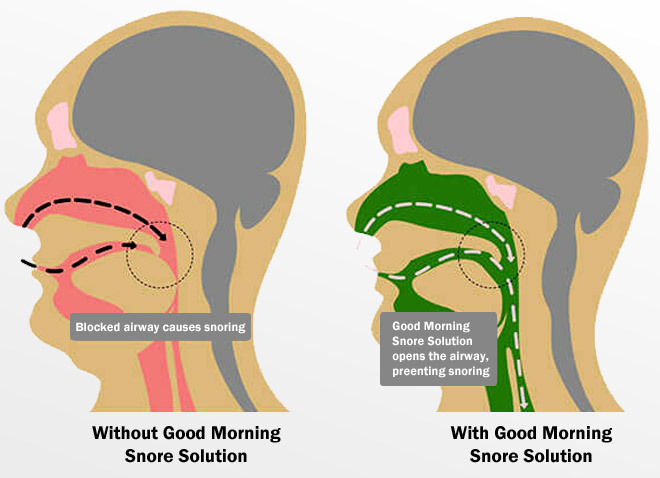 The Good Morning Snore Solution is based on the concept of opening blocked airways, which works by using the idea of tongue displacement instead of jaw displacement. During the suction process, the tongue is slowly lifted forward and the blocked airways open up. The Good Morning Snore Solution does not make use any BPA and latex and it has registered with the FDA, EEC AND also the TGA Australia. Safe and Comfortable – The Good Morning Snore Solution is manufactured from a thin a flexible BPA- free and latex- free material. The mouthpiece is very comfortable to wear while sleeping and it won’t disrupt your sleep. There is no reason for you to ever use any dangerous or other poor quality oral devices anymore. No Customization Required – The product will suit your needs in an extraordinary way, thanks to its unique design. With the help of its suction, an attachment through the tongue is obtained. The suction is pretty versatile and could be customized if you prefer, based on the air stuck in the suction bulb. Tested and proven – Most people are afraid to try out a new product, until they know for sure that it has been approved by the health authorities. The good news is that the GMMS has been approved by the FDA and they actually certify it’s truly an effective product. Furthermore, GMSS is registered with global bodies such as TGA Australia, the EEC and Health Canada. In line with reports on its Facebook page, it’s licensed for sale in 26 countries. Very Affordable – In terms of cost, GMSS got you covered. The price of each device costs $99.84 and an additional $19.95 intended for shipping. 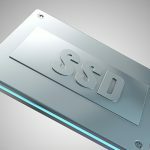 The device could last for as much as 1 year if used on a regular basis. Cleaning your device is also an easy process. 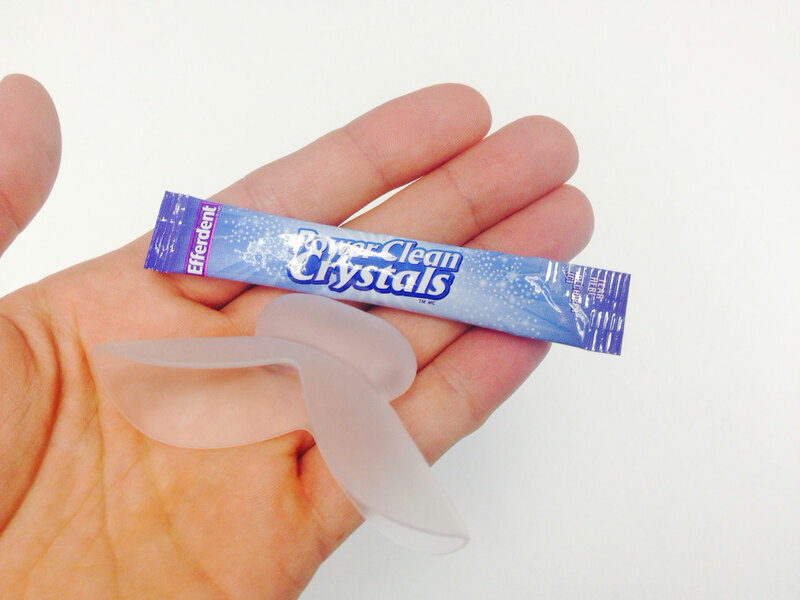 You clean your mouthpiece by using a denture cleaning formula, which can be bought from your local pharmacy. Make sure that you clean it daily after every use. With the correct use and maintenance in place, you can be sure that you’ll make use of it for the specified time period. If you are still unsure if this product is worth buying, you will find that it comes with a 30-day trial without any risk attached. Many people choose to first test a product before investing money in it. In addition, if you are not 100% satisfied with the product, you can return it. I have used several other products in the past and was not satisfied with the results, until I came across GMSS. While this product fits properly in all cases, it might not be ideal for a couple of individuals. In particular, people with bigger or even smaller mouth sizes than the average may find it difficult to keep the mouthpiece attached to their mouth. Thus, should you fall within this category, bear that in mind. The GMSS includes no side effects, compared to other products. However, it may bring about tongue soreness to a new user, or if used for a long time period. But normally, the soreness will disappear naturally. In very rare cases, some individuals salivate more from making use of it. The single most important downsides are the fact that mouth breathing isn’t supported at all. An air- tight seal must be attached at the lips; therefore people breathing through their nose will be comfortable making use of it. 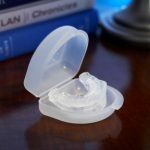 An anti-snoring solution that includes a breather will be fine for those who sleep with their mouth’s open or have any nasal congestion symptoms. If you look carefully, you will find that the downside of this product is really quite insignificant in comparison to the benefits you get from using this product. Therefore, if you’re a nose breather, like me, then this could be the best solution for you. How Effective is the Good Morning Snore Solution? The GMSS comes with plenty of benefits. 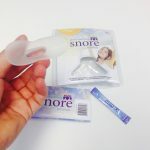 While there are some opinions that direct you to the downside of this product, the majority of users spoke positively about the Good Morning Snore Solution, which confirms just how effective this product really is. You can obtain the best deals at the product’s official site; however, this offer is only valid for a limited time period. At the moment you can receive a $20 discount for a single piece as well as a $60 for a family pack. In addition, if you order this product from the official site, you will receive a 30-day money back guarantee.